• In-depth consultation – I’ll ask you to fill out a form so I can get to know more about your novel. After it’s received, we’ll have a full in depth consultation to discuss your vision for the cover. We can discuss this via Facebook Messenger, email, or phone. Whichever option you’re most comfortable with. • Hassle free change requests – I’m all about open communication. Once I send you a design proof for review, I’ll ask that you be completely honest with me on what you like, don’t like, or want to see changed. This is the time to speak up! We’ll work together to nail the final design. • Photos – Each cover includes non-exclusive stock images. Of course you can supply your own images for the design, just be sure to send me the license agreement showing proof you have the rights for it to be used on a cover. • Cover Files – Once the cover has been approved, I’ll email you the cover files. For eBook or audio covers, you’ll get the 300 DPI JPEG file. If you purchase print, I’ll email you the 300 DPI JPEG file for promotional purposes, and once the page count, trim size, and backmatter of the book has been finalized, you’ll receive the PDF version of the cover file to upload for print. 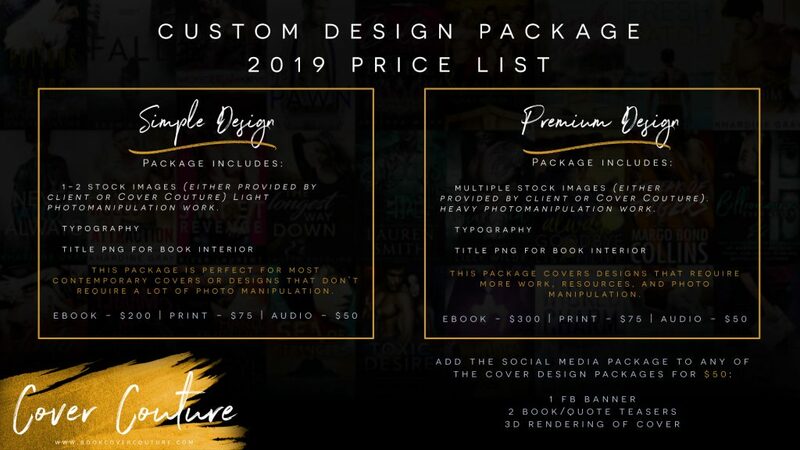 Please contact me regarding special bulk discounts of 3 covers or more, or if you’d like to build a package with several a la carte items to bundle & save! I’m typically booked a month or two in advance. If you need a rush, I will do my best to accommodate your needs, as long as I can fit it in without sacrificing current projects. We can discuss your need and, if I can work it in, there will be an additional rush fee depending on the project. Please read Terms and Conditions before filling out the contact form below.